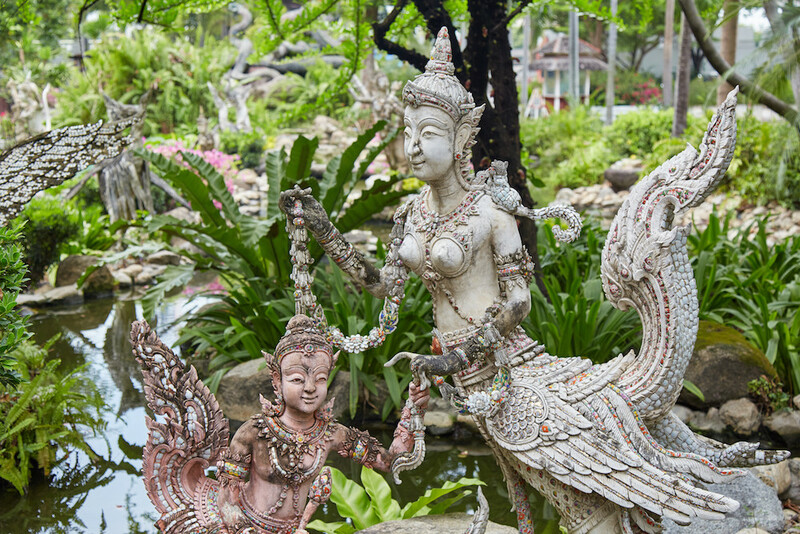 The unassuming suburb of Samut Prakan, about 30 kilometers outside of Bangkok, is home to one of Central Thailand’s most unique and awe-inspiring attractions. Visible even from the highway is a 29-meter bronze elephant which towers over its surroundings. Not only is the 250-ton elephant massive, but it also has three heads. And to top it off, you can actually go inside. The Erawan Museum, as the site is called, is more than just a museum. 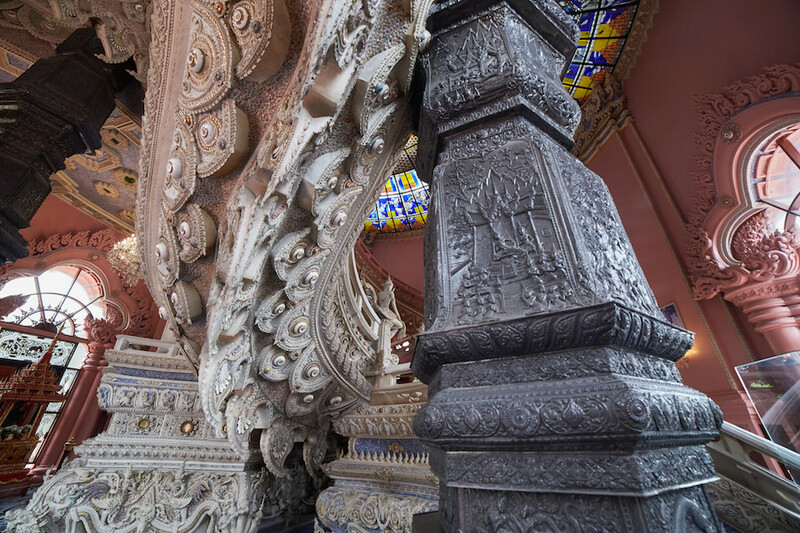 Created by the late millionaire Lek Viriyaphant, the inside of the elephant is home to a Buddhist temple, Hindu shrines, a stained glass ceiling and intricate wood carvings. Furthermore, the entire place is teeming with symbolism. These various features all come together to create one of Bangkok’s most alluring locations. Born in 1917, Viriyaphant attended university in Shanghai before inheriting his family’s pharmaceutical business upon his return. He would also go on to found several new businesses of his own, such as auto assembly plants and even Krungthai Bank. But Khun Lek, as he’s affectionately called in Thailand, did not let business distract him from his passion for history and Thai cultural heritage. He started amassing a collection of antiques from ancient cities around the country, such as Ayutthaya and Lopburi. Viriyaphant also spent a lot of time visiting and researching these ancient sites, along with ruins in neighboring countries. These experiences helped provide him with much of the inspiration for his eccentric architectural projects like the Erawan Museum. Construction of the Erawan Museum began in the mid-’90s, with Khun Lek’s oldest son handling most of the responsibilities. Khun Lek passed away in 2000, a few years before the completion of his masterpiece in 2004. Just as the Erawan elephant has three heads, the inside of the museum has three sections. Lek Viriyaphant used themes from Buddhism and Hinduism when designing the museum. The most obvious of which is the concept of the three worlds: the underworld, the human world and the heavens. This theme repeats itself again and again throughout Asian architecture, and is closely related to the legend of Mt. Meru. Mt. Meru, a mythological mountain, is considered to be the center point of the universe in both Hindu and Buddhist cosmology. The mountain itself is said to have three sections, with the gods residing in the celestial realm at the top. The mountain is also said to have four smaller peaks surrounding the main one. 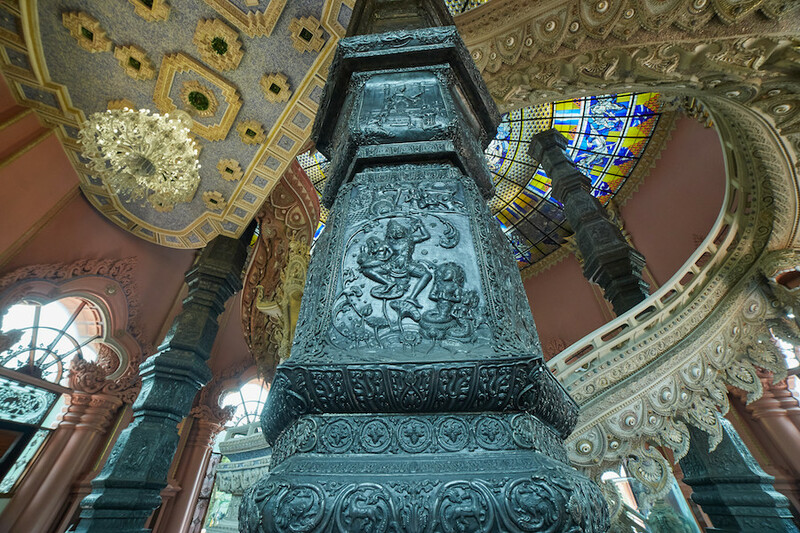 As you’ll read more about below, the main room of the Erawan Museum features four symbolic pillars. Most visitors to the Erawan Museum start by entering the main room, with its entrance at the base of the pillar on which the elephant stands. The room symbolizes the ‘middle world,’ or basically the 3D reality of our everyday existence. One of the first things you’ll notice is the stunning, circular stained glass ceiling. This was designed by the German artist Jakob Schwarzkopf and combines a world map with the zodiac. Four pillars around the room represent four major religions: Theravada Buddhism, Mahayana (or more specifically Chinese) Buddhism, Hinduism and Christianity. 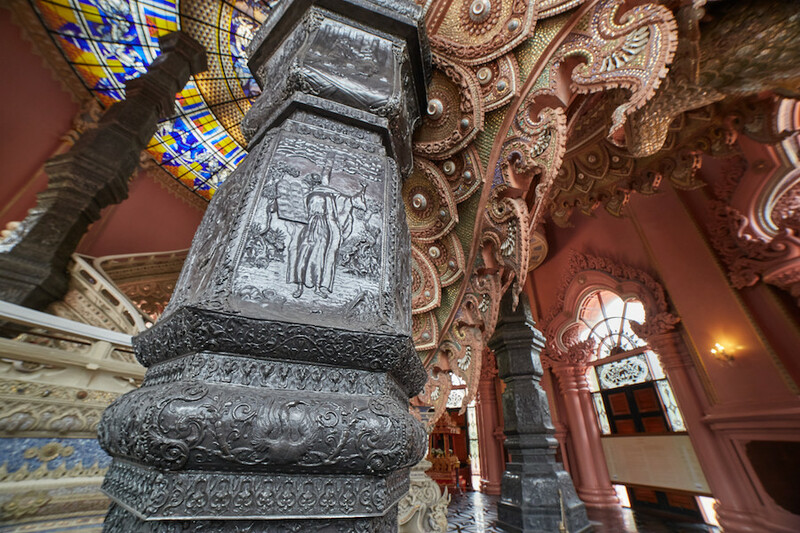 All around the pillars, images of important scenes or figures from those religions are depicted in the form of carvings, with detailed informational plaques providing background info for each one. 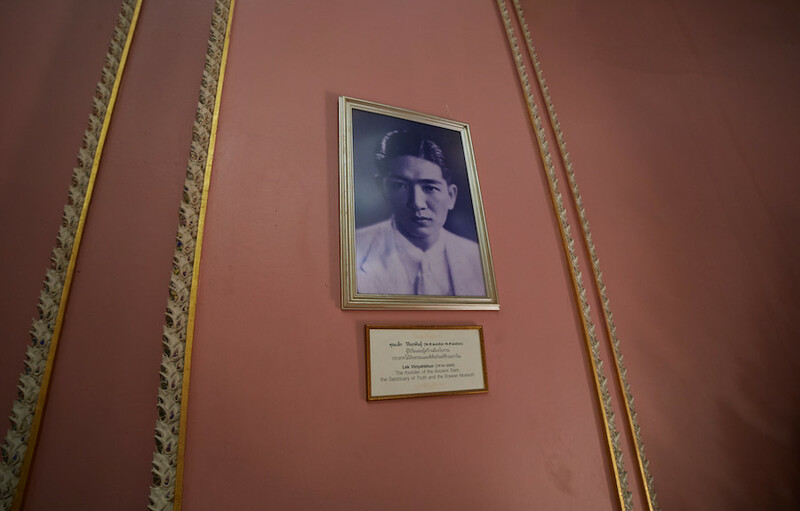 It’s clear that Khun Lek hoped for visitors to ponder the similarities of each religion, making the Erawan Museum more of a temple to a ‘universal religion’ rather than any one specific belief system. At the middle of the staircase, before it splits into two, is a shrine to the Chinese Buddhist goddess of compassion, Guan Yin. For those interested, there’s a detailed account of her backstory next to the Mahayana Pillar. It’s interesting to note how internationally this Chinese deity has spread. Not only does she appear in Thailand, but throughout Indonesia as well. Out of all the areas at the Erawan Museum, this main room will occupy the most of your time. There are so many details to discover in every corner. Furthermore, walking around the room constantly provides interesting new perspectives of the curvy staircase and stained glass ceiling. After reaching the top of the main room’s staircase, you’ll find another spiral staircase taking you even higher. While not obvious at first, this staircase is actually situated in one of the rear legs of the elephant! If you don’t want to make the climb, you can find an elevator in the other leg. 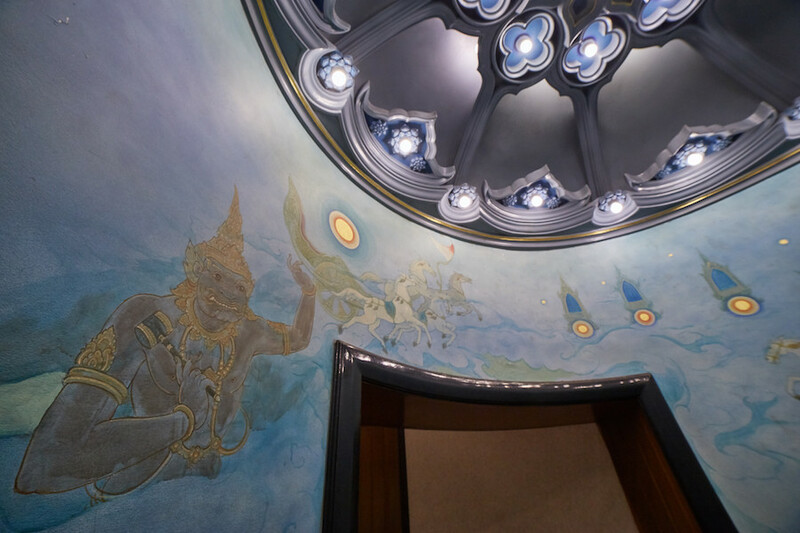 As you ascend up the staircase, you’ll see a colorful depiction of the Hindu bird Garuda – which as you’ll read more below, is closely tied into the legend of Erawan. 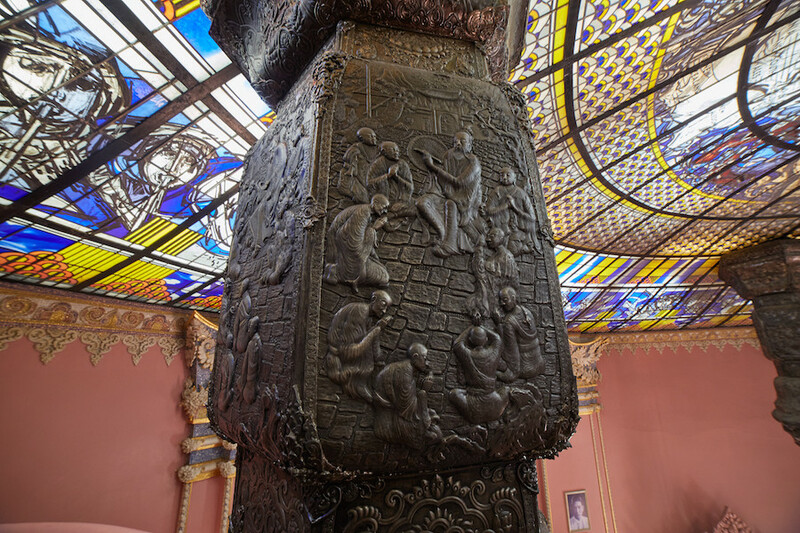 Eventually you’ll make it to the top room, representing ‘Tavatisma,’ the celestial realm of the gods. But this room also happens to be right inside the massive three-headed elephant’s belly! The basic layout of this room resembles a typical Thai temple, with a Buddha statue and various offerings at the center of the altar. Behind the altar are pointy shapes representing the peaks of Mt. Meru. The colorful ceiling helps make it feel even more as if you were standing on top of a massive mountain. 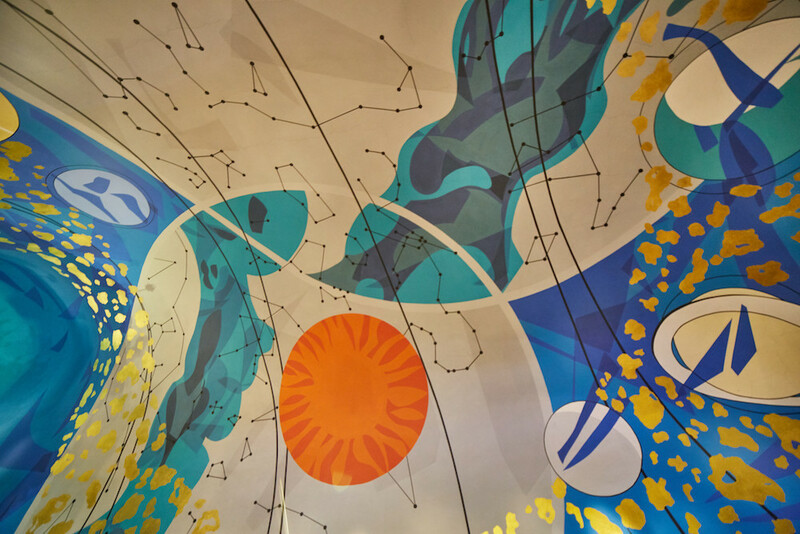 Outer space is represented by bright blue and orange circles and glittering gold stars. You can also spot the shapes of various constellations. This top room is also home to some ancient Buddha statues from the private collection of Lek Viriyaphant. They come from the old Thai capitals like Ayutthaya and Lopburi, in addition to the neighboring Khmer kingdom. For whatever reason, these statues cannot be photographed while everything else in the room can. While it would be logical to enter the bottom floor, or ‘underworld,’ first, the entrance is not entirely obvious, so most visitors just start in the middle. Once you do find the descending staircase at the base of the pillar, you’ll discover a circular room containing all sorts of Buddha statues and Chinese & Vietnamese vases. While interesting, this area is more like a standard museum doesn’t feature anything too remarkable like the other floors do. 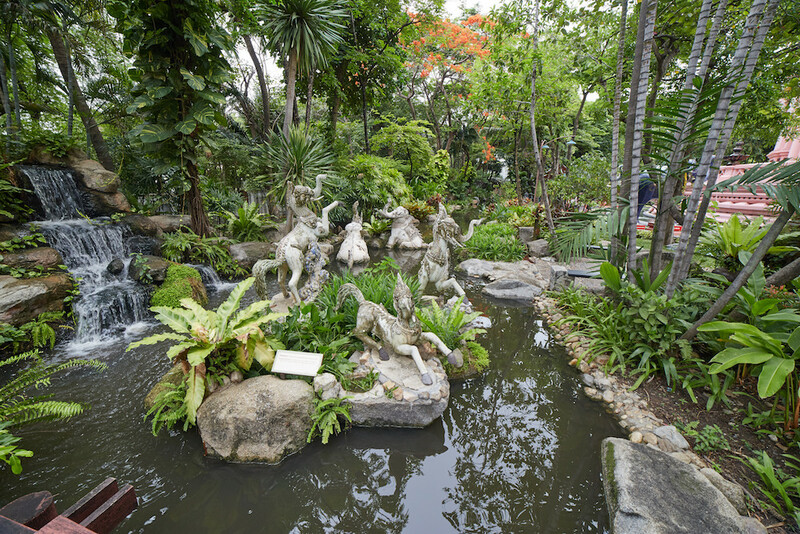 Outside you’ll find a pleasant tropical garden area which is a nice place to relax and rest your legs. There are a lot more elephant statures here, in addition to both Hindu and Buddhist shrines. Erawan is what the Thais call Airavata, the multi-headed elephant from Hindu mythology. Erawan is the king of all elephants and acts as the vehicle of Indra, the chief of the gods and the bringer of rain. According to legend, Erawan was born out of the same egg from which the eagle Garuda hatched after the creator god Brahma sang sacred hymns over it. Interestingly, Brahma is a Hindu deity that actually seems more popular with Thais than with Indians, who rarely worship him directly. Shrines to Brahma can be spotted all over Thailand, depicting him as a golden four-faced being. By coincidence, Bangkok’s Erawan Shrine, which the Erawan Museum often gets confused with. is actually a shrine to Brahma and not Erawan. The name of that shrine comes from the nearby Erawan Hotel. Ancient myths describe Erawan as having 33 heads, but for artistic reasons, the elephant is most often depicted with just 3 nowadays. Considering the importance of elephants in Thai culture in general, it shouldn’t be too surprising that they’ve adopted Hindu elephant gods like Erawan and Ganesha, as there is already a strong link between the two religions. The Erawan Museum is just one unique attraction in Thailand that pays homage to both Buddhist and Hindu motifs. Another famous place is called Sala Keoku in the Isaan province of Nong Khai. Built by Bunleua Sulilat (who also built the similar Buddha Park in neighboring Laos), Sala Keoku is a large park filled with massive, towering concrete depictions of Buddhas and various Hindu gods. Sulilat died only 4 years before Khun Lek, but it’s unclear if the two eccentric creators ever interacted. The most straightforward way to get there would be to take a taxi or Uber from wherever you’re staying in Bangkok. Of course, since Bangkok is a huge city, the price would depend on whichever neighborhood you’re staying in. Most people come by BTS. Simply ride down all the way to the final and southernmost station, Bearing. You will still have to take a taxi from Bearing station to get to the museum, but it will be much cheaper than taking one from the city. At the time of writing, construction is taking place to expand the BTS even further into Samut Prakan. Word is that in the near future, a new station will open up even closer to the Erawan Museum, eliminating the need for a taxi. There is actually a free shuttle bus that can take you from Bearing station to both the Erawan Museum and Khun Lek’s other creation, the Ancient City. But the bus only leaves at 11:30am on Tuesdays, Thursdays and Saturdays. The biggest complaint most foreign visitors have about the Erawan Museum is the ticket price. If you’re Thai, the Erawan Museum only costs 200 Baht to enter. But if you’re a foreigner, it costs double that! Having to pay extra as a foreigner for temples and other historical places is pretty normal in Thailand. But the price difference is usually in the tens of Baht range. In the case of the Erawan Museum, a 200 baht increase is astronomical, especially considering the faraway location of the museum. Keep this information in mind before making the trek out to Samut Prakan. Many people first learn of the price at the museum’s ticket booth, which can really hurt one’s first impressions of the place. Hopefully this silly and unfair pricing system will be abolished soon. As the Erawan Museum is not just a museum but a place of worship, visitors are supposed to wear proper attire, i.e. long pants and tops which cover the shoulders. Despite information online mentioning the dress code, though, it’s not actually enforced. I wasn’t too pleased to be sweating in long pants on a hot and humid Bangkok summer day, only to see many other guests get in wearing tanktops and shorts. So whether or not you actually want to follow the dress code is up to you. Bangkok is a massive city, and the Erawan Museum is relatively far away in the suburb of Samut Prakan. The most strategic place to stay, then, would be anywhere near a BTS station. For a city of its size, Bangkok’s public transport system is quite limited and the BTS only has a couple of lines.